Rovers players Andy Butler and Alfie May took time out to carry out the draw for the 2018/19 EFL Kids Cup - which will take place at the Keepmoat Stadium. The duo drew the teams into their respective groups, as more than 40 teams have been entered for this years’ competition – a record amount. The EFL Kids Cup is one of the main events in Club Doncaster Foundation’s schools’ calendar, as each school starts their journey to play at Wembley Stadium. Sports development officer for the Foundation, Kelly Jackson-Powell, said: “It was great to have Andy and Alfie on hand to help us do the draw. 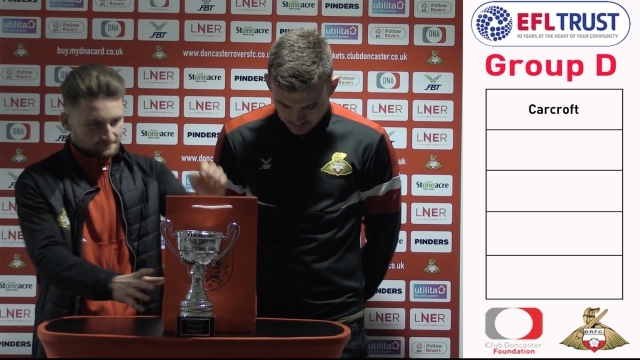 “I know a lot of the kids at our partner schools are Doncaster Rovers fans, so to have the players doing the draw this year was fantastic for us." The competition is to be played on Friday, January 25 at the Club Doncaster Sports Village. The annual event, run by the EFL Trust, is one of the country’s largest national football competitions and sees more than 16,000 children take part across the 72 EFL clubs. Website designed and developed by Keane Creative Ltd.